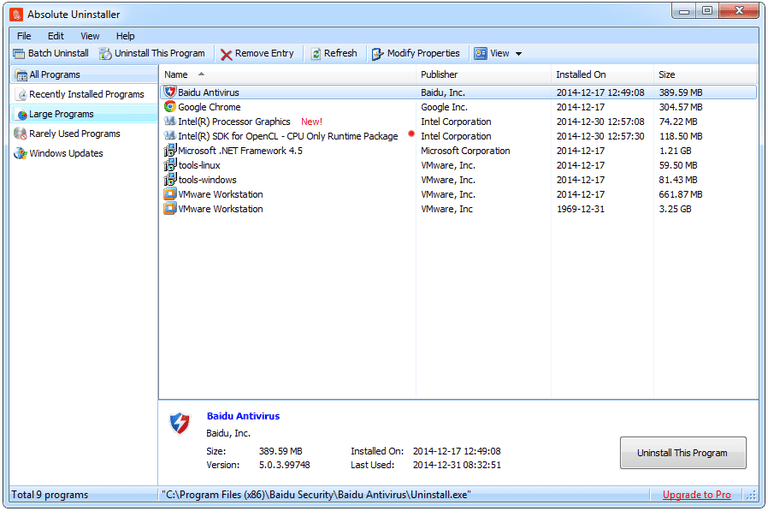 Absolute Uninstaller is a software uninstaller from Glarysoft, the company behind some other tools I've recommended, like Glary Undelete and Registry Repair. Absolute Uninstaller isn't as advanced as some of the more popular program uninstallers, but it does support batch removals, includes a search function, and can backup all the uninstall information to a REG file. This review is of Absolute Uninstaller version 5.3.1.24, which was released on April 22, 2019. Please let me know if there's a newer version I need to review. Absolute Uninstaller is really well designed. There aren't too many buttons or options so it's rather easy to use. I think the batch removal feature alone is enough to convince you use it as a replacement to the default uninstaller tool in Windows, which doesn't support batch uninstalls. The batch uninstall feature is great to have but it unfortunately doesn't work as well as similar software uninstaller programs. When multiple programs are selected, each and every uninstaller is launched at the same time. This is different than Comodo Programs Manager and IObit Uninstaller, for example, in that those programs open the uninstallers one at a time to avoid cluttering up the screen. Most program uninstallers include a search function, so it's too bad that there isn't one with Absolute Uninstaller. Aside from the above downfalls, I do like the fact that you can backup all the uninstall information to a REG file. Mainly for more advanced users, what this does is lets you create a backup file of all the registry items so you can look through it to see exactly what the registry points to for each program. After Absolute Uninstaller has finished installing, setup will ask you if you'd like to install another program from the same developers, but you can easily decline by unchecking that option.